Since we live rurally I like to be prepared for any medical emergencies. It's not like we can run across the street for bandages. In addition, we are always outside and with three boys (plus a husband) someone is always getting banged up. I think my first aid is probably a little more obsessive extensive than the average person's, but that could be a good thing. I'd rather have it and never need it than the alternative. As you can see above, I got everything out recently when Pierce cut a big slice in his finger using scissors in an after school club. I put peroxide on it and then steristrips to hold the cut together, plus a bandage on top of that to keep everything clean. The tupperware to the left above has various supplies and medicines, and the tote on the right is all bandages. It may seem excessive to have so many bandages but we discovered when Paul had his bike crash with major road rash that you can go through a lot of bandages quickly for just one injury (he was changing large bandages twice a day for three weeks). So it's good to have all different sizes and types. I also keep some vet bandages (which could be used on humans or horses) and some specialty bandages (like an Israeli army bandage, an expensive bandage, but if someone had a severe cut with a lot of bleeding it would be important to use something like this until we could get to the hospital). I like to keep a couple of bottles of Hibiclens which is excellent to cleanse cuts that might be vulnerable to staph. 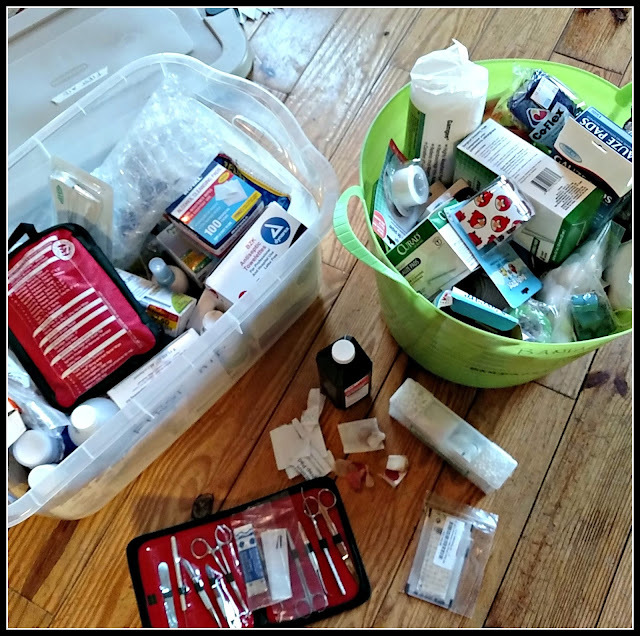 I have all sorts of ointments, eye wash, a snake bite kit (I actually did research on this to see which, if any, were actually effective - we had a neighbor bit by a copperhead while gardening), and lots of random useful items I've read about in various first aid books. I have several first aid books I've picked up at thrift stores, and a couple of nursing and medicine books. Plus, all the tinctures I made last fall and a few essential oils (like oil of cloves, which is excellent to use for a toothache). In addition to reading the books, I've watched Youtube videos on how to use some of the specialty bandages, and I've taken first aid and CPR through my job. Hopefully no big emergencies will happen, but if something does, at least we will be reasonably prepared. Readers - do you keep much in the way of first aid supplies? Do you feel prepared to handle an emergency at home? You are very smart to stock so many first aid supplies. Your post serves as a reminder to me to re-stock our kit. John works out in the yard often and I need to take inventory of needed supplies. Wishing you a nice day. My son's type 1 diabetes is one of the main reasons I live in town, close to the hospital. The ambulance is just a few minutes away and I can drive him to the ER if need be. My medical kit has been the same for a while: things to handle a super low and things to handle a super high bg as well as seizures. As a former EMT, I can handle most emergencies... at least long enough to keep them going until help arrives. Since you are doing a post on your first aid kit, it would be appropriate and beneficial to list the contents. That looks like my liquor cabinet! Excellent preparation, Lisa! I'm sitting here thinking of our meager supplies at home. Even though we can get to the store quickly, when emergencies happen, you need things right NOW. So I need to get better prepared. I learned a lot about bandaging a few years ago when I cut a chunk out of my finger when I fell with a coffee mug (no one ever called me graceful). It could not be stitched together, so the doc cauterized it. Then I had to wear thick bandages for about 6 weeks, changing at least twice a day. great way to be prepared. We have some supplies, but could do much better! Awww this is interesting.. Just a week ago we were thinking about updating our emergency kit,,, in case of earthquake.. In 93 we were hit hard by the spring break quake out of Molalla.. The epictenter is kind of under our house! But we also live in the part of the NW.. where the big one will happen eventually. We need to update our stuff.. because we found out,, that food in cans,, can rot and even eat up a cast iron fry pan,,, We need a kit like you, thank you for reminding me.. And we need to store our stuff outside,, maybe in a culvert or something. I think you have more stuff than I do. And you keep it organized, which is really important because there's not time to waste in an emergency. Looks so complete! Mine is minimum supplies. I'd rather be overprepared too. And yeeouch to the sliced finger! We used to have what was dubbed the First Aid Bathtub! A great item to add to your kit if your doc will write a scrip for it, is Silvadene Burn Cream. It is excellent treatment for road rash, as my DH and I can both attest from personal experience. I used to be a be prepared woman but not so much now..very smart looking emergency prep!! We are definitely stocked up on supplies, but we also live 5 minutes away from stores in every direction. I think it's important to have a good supply on hand, though. ESPECIALLY if you have kids! This is an excellent idea. Good for you! I need to add to ours. Isaak has been especially clumsy this week. He fell 3 different times. We have the basics, but I can't promise I'm good at using anything. I'm better with my "cold" emergency kit; I know exactly how to treat a cold and cough and keep them from developing into something more. I'll be the first to admit that I'm not very good when it comes to cleaning out wounds etc. I'll do anything for my loved ones, but if I can rely on a doctor or nurse...I know they'll receive much better care!